At last, it’s back to work on Action Figures – Issue Four: Cruel Summer! 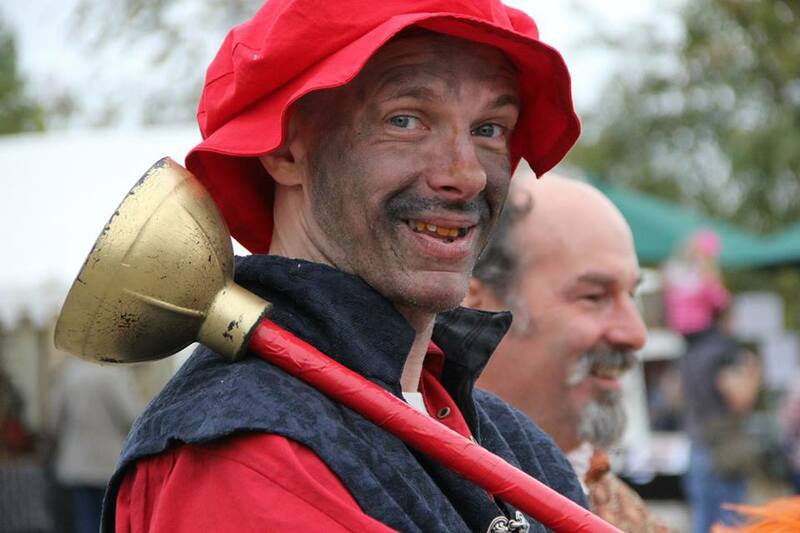 The author during his outing as a medieval plumber, and no, that is not a joke. 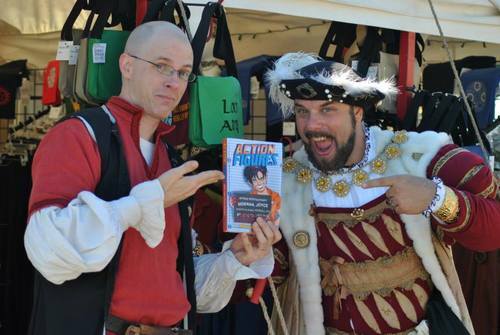 Last weekend I was otherwise occupied working the Connecticut Renaissance Faire, mostly with my wife (Veronica of Storied Threads), and one day with my friend Scott Kegler, assisting him with his street act for the show…not that he needed me, because the man is a dynamo of comedy. Watching him was a serious education in the art of clowning. I got to work the faire on my favorite of the show’s theme weekends, Time Travelers Weekend, when patrons are encouraged to go a little crazy with non-period costuming. My wife took advantage of the looser rules on participant garb and helped mastermind an Avengers-themed presence among other merchants and the gaming crew. As you can see from one of the photos, no less than Clark Gregg himself approved of the Marvel-inspired surcoats created by my wife. 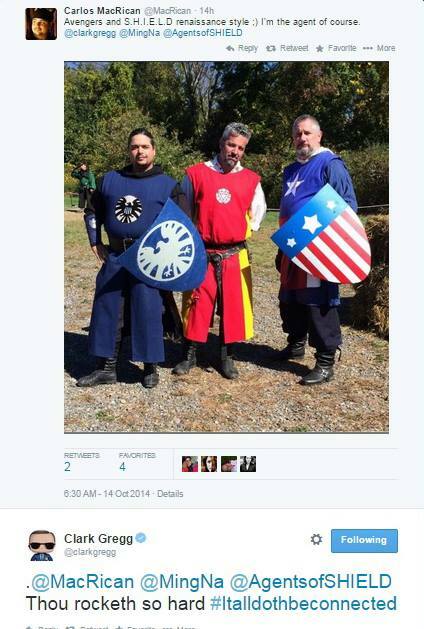 My friends Carlos, Greg, and Artemis in their cool Marvel kinghtly surcoats. That weekend also featured the Doctor Who costume contest, co-judged by my wife, who dressed for the occasion in her Tenth Doctor-inspired ensemble, and our friend Krystal (the winner was a kid who built with his family’s help a full-sized Dalek outfit). 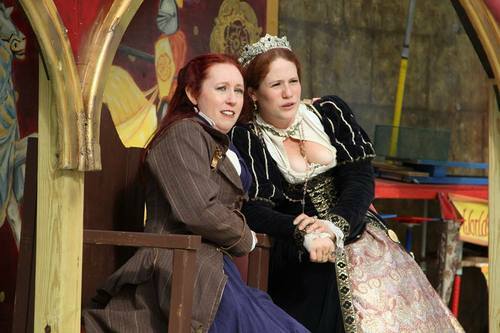 My wife and Krystal hosting the Doctor Who costume contest. 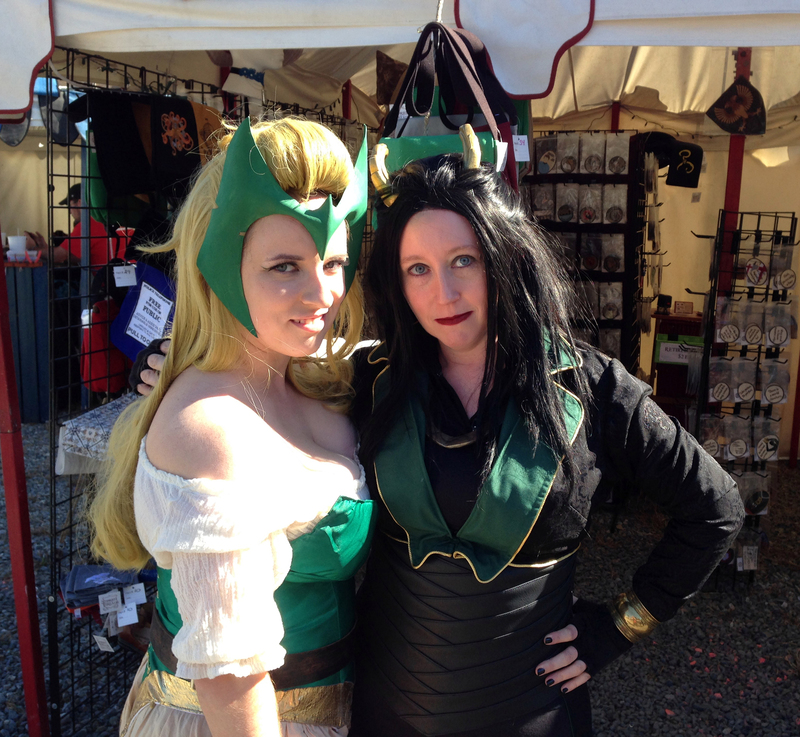 My wife in her Loki outfit and a friend as the Enchantress. My friend Christian after a dramatic reading of book three. And yes, he read it in character. It was a riot. Credit where it’s due: photos by Lauren Dubois, Eric Tetreault, and Jamie Tarbell.